Outtakes comes from photographer Joshua Dudley Greer and continues today with images from Amy Stein. Amy Stein (b.1970) was raised in Washington, DC and Karachi, Pakistan. She holds a BS in Political Science from James Madison University, an MS in Political Science from the University of Edinburgh and an MFA in photography from the School of Visual Arts. She has been exhibited nationally and internationally and her work is featured in many private and public collections such as the Philadelphia Museum of Art, the Museum of Contemporary Photography, the Nevada Museum of Art, the Nerman Museum of Contemporary Art and the George Eastman House. 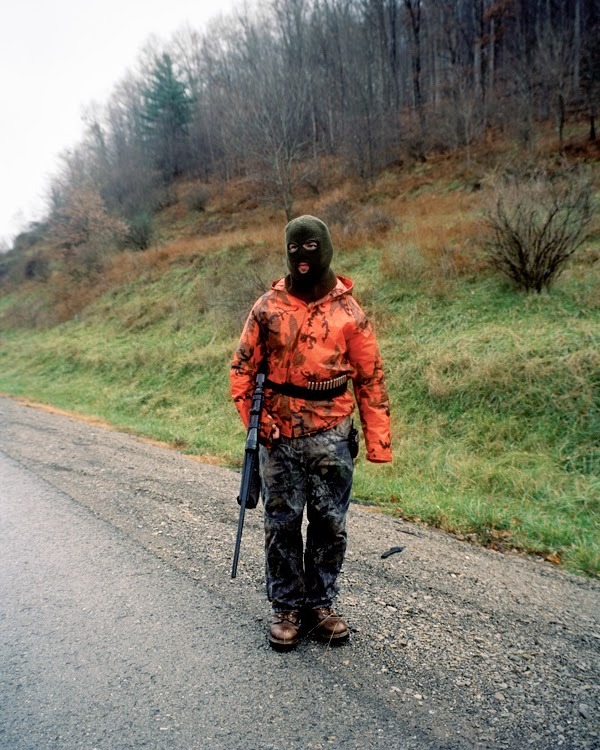 In 2007, she received the Critical Mass Book Award for her series, Domesticated, which was published in 2008 and went on to claim the Best Photobook Award at the New York Photo Festival. Her second book, Tall Poppy Syndrome, a collaborative project with Stacy Mehrfar, was published by Decode Books in 2012. Joshua Dudley Greer: In your series, Domesticated, you constructed scenes to be photographed based on actual interactions between animals and humans. Were these narratives just a jumping off point for your images or are you staying pretty literal with the information? 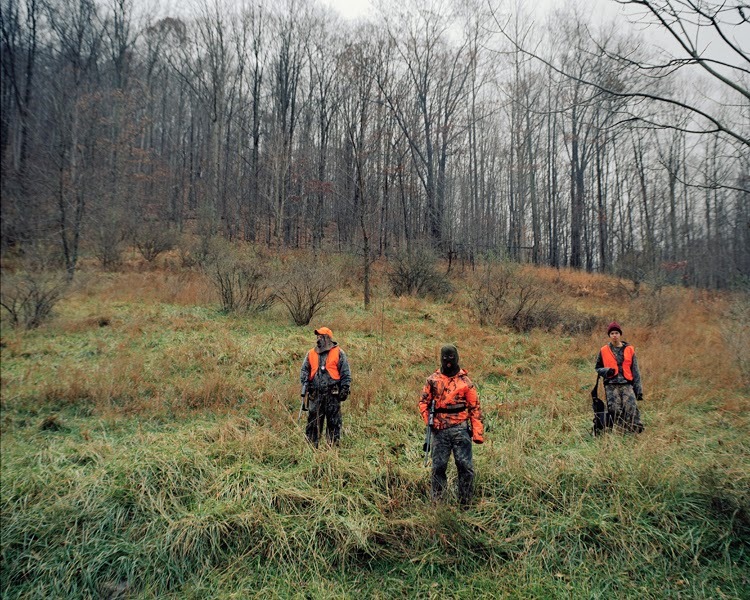 Amy Stein: The stories were often just a starting point on the path to the final image. In many cases the story details I had access to were very spare or rough, just a few lines in the local newspaper or police blotter or a quickly recounted memory told to me by a local resident. But I found these broad strokes enough to inspire the general theme and eventually the details of the image, which I was more than happy to fill in. I consider the images in the series to be fictions based on facts. JDG: In the case of Howl, what was the narrative that inspired the picture? AS: This is one of the richest and most bizarre stories from the series. Down the road from the center of Matamoras, PA, where the series is set, is a Target. Someone mentioned to me that the Target employees who work the late shift had spotted coyotes in the parking lot at the end of their shift. 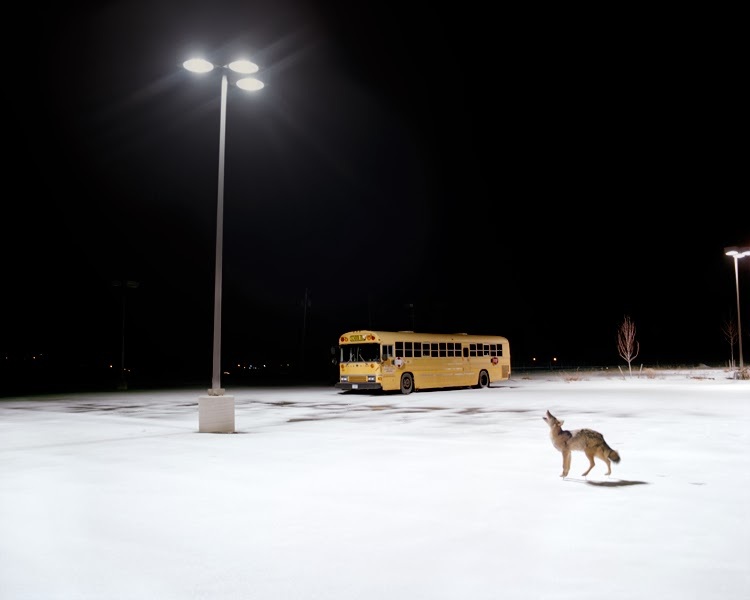 The coyotes were said to be running around in the parking lot yipping and howling. When I visited the parking lot (at dusk) I saw the standard issue overhead lights illuminating the lot. 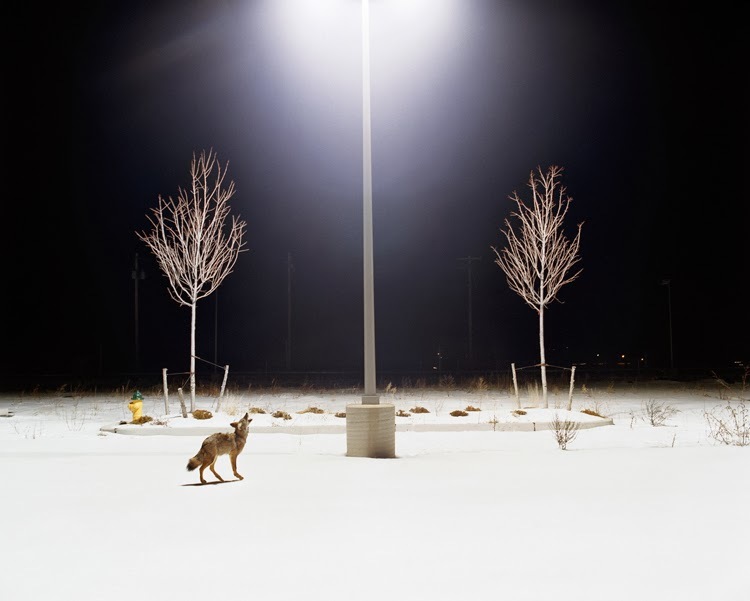 I became interested in the coyotes’ relationship with the lights and imagined them as false moons that were seductive and disorienting to the animals. After that the image just fell into place. JDG: I love the idea of the artificial light acting as a surrogate for the moon and how that relates to some of the central concerns of this series about constructed spaces and the wild. In these three images, we get to see three different approaches concerning the light pole - one image shows it in its entirety, one image shows only the light that’s being emitted, while the image you ultimately chose strikes a balance between these two. Was it a conscious decision to imply but not fully describe the source of the light in the photograph? AS: Yes, exactly. The final image was the obvious choice because in it the light is spreading, perhaps due partially to lens flare, in a spherical shape that references the moon. The two symmetrical trees also add to the graphic quality of the image and reinforce the reality of the manufactured space of the lot. 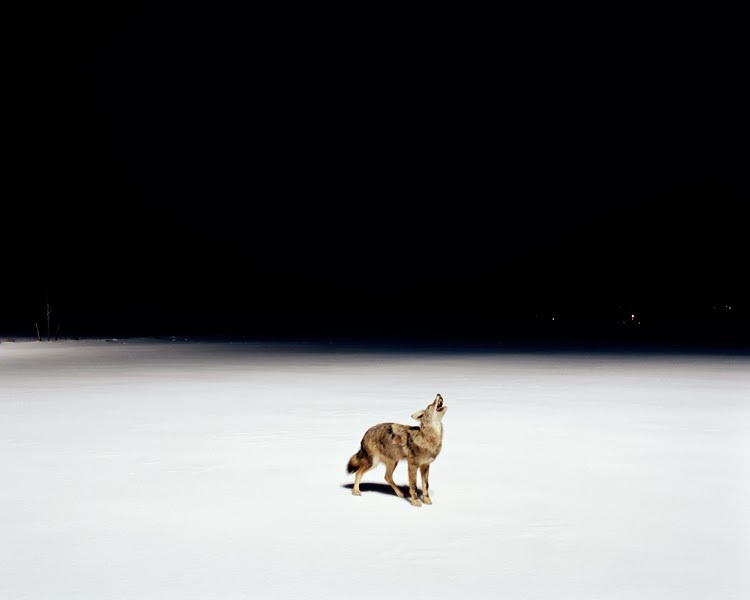 JDG: I think the image of just the coyote is quite striking, but is it lacking something for you? AS: For me it’s striking in a different way. The expression of the animal is more visible and conveys stronger emotion, but the light as a distinct object is missing and its presence is less specific and more ambient. The final image works much better for me because of the concrete presence of the pole and light. JDG: Ordinarily I think a lone school bus in an empty parking lot would seem like a real gift, but in this case, it seems like maybe it complicates the narrative in a way that you didn’t want. AS: Yes, I love the way it looks in the frame but thematically it’s unrelated to the other elements in the image and as you point out, introduces the possibility of another narrative. JDG: Naively, one might think that because these photographs are pre-conceived and staged to a certain extent that the final image was perfectly clear in the artist’s mind beforehand, but based on the variations we see here, it’s pretty evident that you’re still allowing yourself the freedom to make lots of different pictures. AS: Absolutely. For this series I approached each image and scene with a loose plan that included the animal, sometimes a human subject and location, and the firm expectation that something would go wrong or would not work. I had to improvise to some extent on every image. JDG: Plus you often have the added complexity of working with people in this series. I imagine that adds to the possibilities. AS: Yes, of course. When working with subjects I give a general direction and then let them improvise to the extent that they’re comfortable with that. Then I move around a lot and we try a number of different angles and perspectives on the scene. For this series I really did shoot each scene until I had exhausted either the subject or myself, or both. JDG: Do you ever make sketches or anything like that beforehand? AS: No sketches. Just lists and scouting shots of the animals and scenes. JDG: You made many variations of this particular setup. At times the children grow in number, get quite close to the raccoon and seem to be the obvious aggressors without much fear. However, in the image you selected, the distance is greater and the two boys seem more timid, possibly just as scared as the animal. AS: I tried many scenarios with this image. I was lucky enough to find a group of young skaters who were willing to work with me to tell this story. 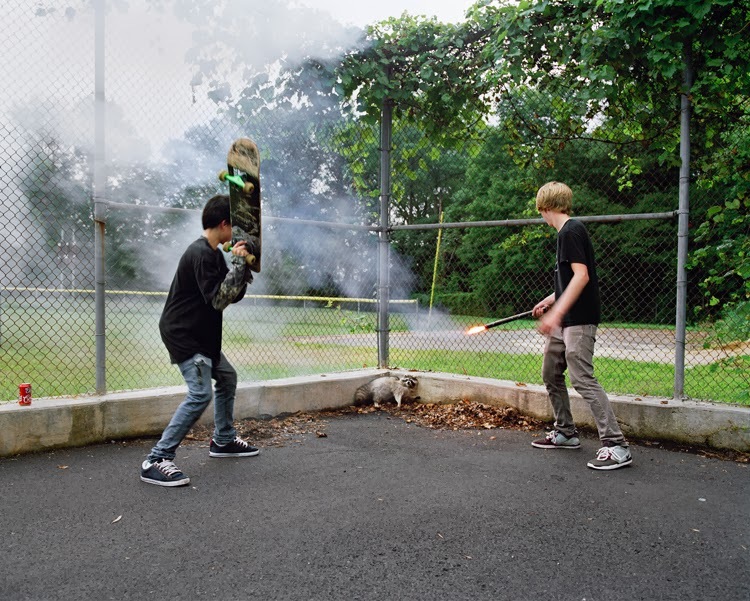 I didn’t want the image to read simply as young male aggression toward a defenseless animal. That’s a story we’ve heard before that is tragic and sad for all the parties involved. But I did want to talk about a gut level mix of fear and response. I hadn’t considered the fact that the boys are equidistant to the raccoon. There is a nice symmetry to the placement of the figures in the trio that I hadn’t noticed before. I was more concerned with gesture and the believability and readability of the image. The additional figures in the larger groupings seemed to crowd and confuse the image. The firecracker in the image, a roman candle, is important as well. I brought it to the shoot because I thought it could be an important element in the picture. The town of Matamoras is located at the border where New Jersey, New York and Pennsylvania meet. I think it’s legal to buy and sell fireworks in PA but not in NY and NJ. Consequently there are about 10 massive fireworks outlet stores in Matamoras and the surrounding area. Many more than there are churches, grocery stores or restaurants. You see people playing around with fireworks at all times of the year. It’s sort of ridiculous. I wanted to include a firework in one of the images as a nod to their ubiquity in the literal and cultural landscape of the town. JDG: It looks like the cast changes from image to image and at times you have one boy address the camera. That singular action changes the way I read those photographs – it seems like it implies an awareness of the act that I don’t necessarily get from the others. AS: The choice to have the boy face the camera was very specific, and an outlier within the series. It involves and potentially implicates the viewer in a way that the others don’t. I eventually edited it out for that reason. 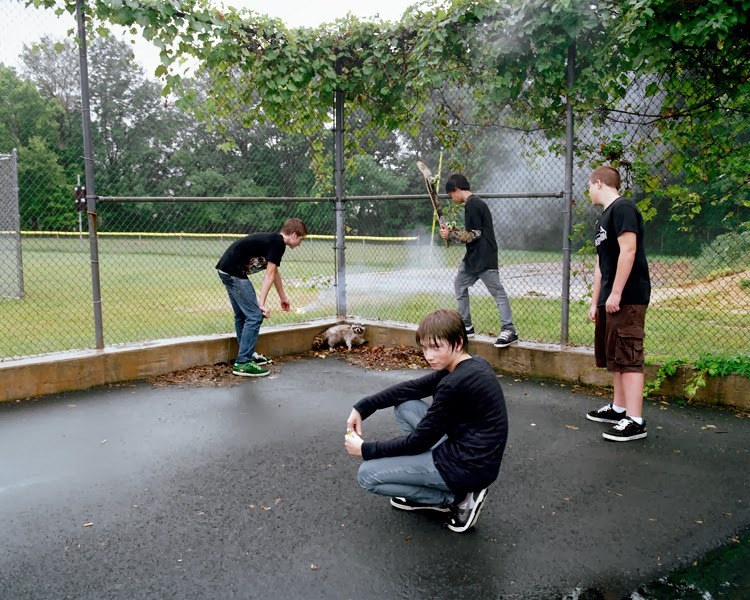 The final image affords the boys a bit of anonymity, and focuses primarily on their body gestures as they menace the raccoon, which is where I think the tension of the image resides. As an aside in the middle of this shoot it started to pour. These boys were kind enough to wait in a nearby baseball dugout with me until the rain passed and shooting resumed. We shot for hours and they were too shy or kind to tell me that they would be late for dinner and their parents would be worried. I wonder how they explained the afternoon to them. JDG: While Domesticated was very much a kind of research-based project that involved quite a bit of preparation and planning, it seems like Stranded is at the other end of the spectrum. Are you just driving around hoping to stumble upon these motorists stuck in limbo? AS: Driving, but not just driving. Usually I would fly into a city from which I would base a regional road trip. There I’d rent a car, plan a route and gather food, water and tools like jumper cables, motor oil, etc. I’d then set off along a major highway driving in the right hand lane at a slowish but reasonable pace while looking ahead for stopped cars on the roadside. If I saw anything I’d stop and investigate. I’d drive and shoot and talk to stranded motorists all day and then find a cheap hotel to crash overnight then start the process again the next morning. This would go on for days and days. Some days, when I intersected with breakdowns and was able to shoot, it was exciting, others, when I found no one and drove all day with little breaks, it was excruciating. But back for a moment to your point that Domesticated and Stranded are very different in their conception and execution. They are. I shot the bulk of both projects over the same time period, from 2005-2009. I used those differences to give myself a breather from each project as I switched back and forth. So I was always able to make progress on each project without getting burned out. JDG: How do you think being a woman has affected how people receive you in these kinds of roadside environments? AS: I don’t think I would have been granted access to shoot in many situations. I had the sense that people were skeptical about my presence much of the time so I think a man in my situation would have been met with even more skepticism and perhaps absolute refusal. Many times I was alone with a stranded female motorist along an isolated stretch of road. Often I felt that while they were guarded with me they allowed me to shoot. Women tend to be even more guarded around men that they don’t know. It’s ingrained in us from a young age through womanhood: Don’t talk to strangers, protect yourself from strange men, if you feel uncomfortable get yourself out of the situation or call for help. While these assessments aren’t always fair they are absolutely understandable and often necessary. Even the most unassuming, well-intentioned male photographer wouldn’t stand a chance. JDG: Could you describe the circumstances of this particular encounter? AS: I came across this van at the end of a bad day. It was toward the end of the first trip I made for Stranded, in November 2005. 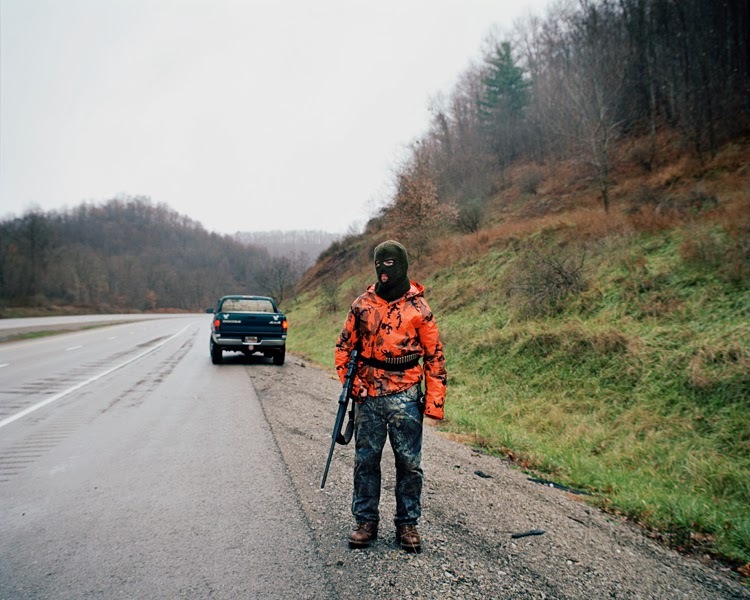 I was exploring the Rust Belt by driving through Pennsylvania, Ohio, West Virginia and Kentucky. The process of stopping and photographing was relatively new to me and at this point I had driven all day and found little to shoot. I had just left Lexington, KY and was pushing through until dark and the motel. On the right side of the road I saw the van and even though I was tired and discouraged, I knew I had to stop. The motorized wheelchair attached to the back was a promising sign. Perhaps because it was cold no one was outside the vehicle. I pulled up behind it and screwed up my courage to approach and knock on the door. When I did the driver told me that they’d run out of gas and that his wife had walked back to the last exit to find gas. They were local and knew of a gas station where they could get help. He was on oxygen and seemed to be the owner of the wheelchair so when I asked him if I could photograph him and the situation, I wasn’t surprised when he declined. But, he said, “my daughters are in the back, maybe they’d pose.” So I opened the sliding door and out peered these three young girls. They agreed to be photographed and we were off to the races. JDG: What was it about this particular girl that made you single her out? AS: There were a number of images from this shoot that had strong potential. I liked the three sisters grouped together, sort of clinging to the entryway of the van. But the more I studied the contact sheets it seemed that Peri had a quality that her sisters did not. Perhaps because she was the youngest, when I asked for the girls to come away from the van the older two demurred and pushed her forward. She stood awkwardly and because she was cold she pulled her arms into her shirt. First I shot her with the van in the background but then when I isolated her from the van and her family the image fell into place. The rest I think is obvious. When I saw the image on the contact sheet, although I liked many of the others from this situation, I knew this was the shot. JDG: Was there a sense of that when you made the photograph or did the realization only occur afterward, when looking at the proofs? AS: Not sure if I can remember that specifically. I do remember a feeling of relief when leaving the scene that I had the chance to shoot something that day and also feeling keyed up, like I may have made an important image. JDG: I think just about anyone can appreciate the tension inherent in approaching a complete stranger who is in distress in an unknown situation. Add to that, the fact that you’re there to photograph not necessarily to help, and I think you have a truly awkward situation, one that many would shy away from. AS: It can be awkward and in those first moments when I approach the person to ask if I can make an image it’s sort of excruciating. But that passes quickly and in the end the discomfort is often well rewarded. 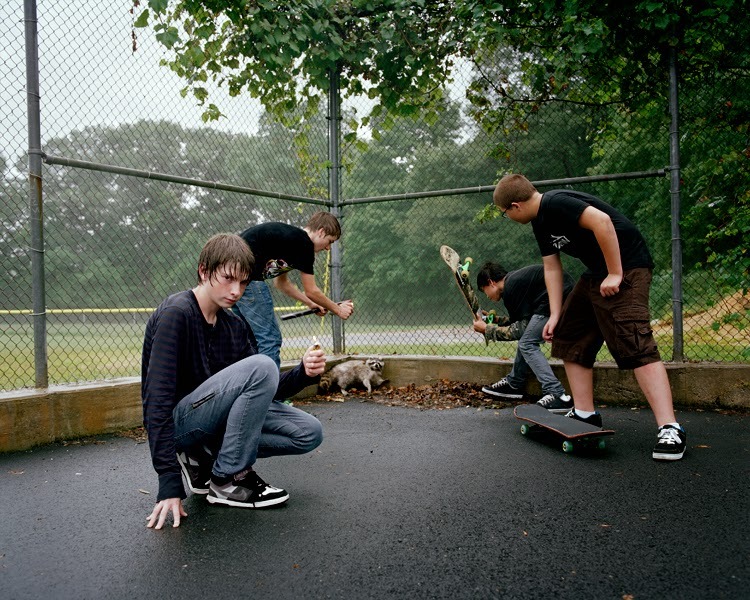 JDG: These photographs seem to literalize the possible danger of the roadside, but in a very specific way. Could you describe the scene for us? AS: It looks more nefarious than it was. Looking back, I was probably in greater danger during more mundane looking scenes. I made this image the day after photographing Peri, while driving through West Virginia on my way back to Pittsburgh. The day was so beautiful; the mountains were foggy and there was a bit of snow on the ground. I spotted the truck on the side of the road idling. Then I saw three hunters climbing up the embankment. I learned that their truck had broken down on the way to the hunting trailhead so they decided to leave the driver and walk into the forest. I spoke to the driver and he called them to come back down to the road. That’s when I made the images. I shot the group on the hillside and then along the road. JDG: This is another example where you started out with multiple subjects and ultimately decided to edit out all but one. AS: Yes, as with Peri, I think the stronger image includes only the single figure. There was really no debate with this image. This was the one. It’s the one that makes people gasp or chuckle when I show it during artists talks. JDG: Although you do have variety in the series, I’m wondering if there’s something about a solitary person stranded alone on the road that appeals to you. AS: Formally and conceptually yes, the single figure along the roadside is the most direct and profound part of the statement of Stranded. The series is partially about vulnerability and isolation in the moment, and in a way that bleeds into larger aspects of an individual’s life. So yes. It’s a scene I gravitate to consciously and probably a bit unconsciously. JDG: But perhaps you’re going beyond being gravitated to it, you’re really cultivating it - you’re creating it. When we only see this one man alone with a truck, it’s a kind of fiction. AS: In a sense, it’s all a fiction to some degree. All artists omit certain elements and include others to craft the story they wish to tell. The circumstances under which they find these elements may be concrete or "factual," especially within the photographic medium, but the results are almost always a fiction of some sort.